Hi from Ewe Ewe Yarns! We’re here and we’re excited to bring you Wooly Worsted Washable yarn in seven bright and fashionable tones. Made from only super soft merino wool, Wooly Worsted Washable is a luxurious yarn with a wonderful twist and beautiful sheen. And, it’s washable. Knit it, wash it, love it! With 95 yards per skein you can work up your favorite knitting projects with one or all seven colors. Our knitting patterns are fun and fresh so knitters can make garments they’ll want to wear and they’re friends will want to make. We offer both sheet knitting patterns for sale in local yarn stores and free knitting patterns that are available on our website. We focus on designing knitting patterns that cute, quick, and could be finished in a weekend. 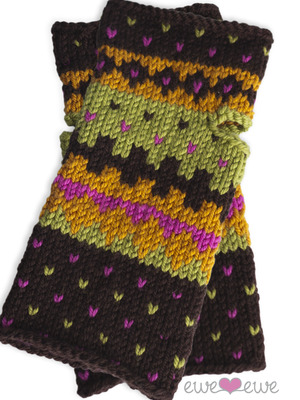 Our Fair Isle Friends wrist warmers are hip twist on a classic knitting technique, the Wellie Warmers keep toes toasty and the Beach Bum Pullover brings style to your little one with our easy care yarn. Created by designer Heather Walpole, Ewe Ewe Yarns is a new take on an old classic. Basic yarns are always in fashion, so Heather created her own with a modern color palette that suits all knitters. For more information visit www.eweewe.com or contact Heather at 760-933-8393 or heather@eweewe.com.